Massive stars end their lives in powerful explosions (supernovae) that span a wide range of energies and properties. The most powerful of these are the appropriately named Superluminous Supernovae (SLSNe). As SLSNe are so bright and energetic, we can see them out to great distances in the universe, and they could prove to be very useful probes of distance and the environment in the early universe. They could also provide important information about the evolution of massive stars. However, we still do not know what makes them so bright and energetic. Is it because they are particularly massive stars with more radio-active material to decay and provide the light we see? Could the powerful shock wave from the explosion be slamming into a dense gas cloud around the star? Or is there another source of energy driving powerful jets of matter through the star and powering the explosion? For a lot of SLSNe it is either difficult or impossible to reconcile the first two scenarios with observations. In this paper (http://adsabs.harvard.edu/abs/2018ApJ…856…56C ), Deanne Coppejans and her collaborators used observations from radio telescopes such as the Very Large Array (VLA) to show that if SLSNe are launching jets of matter, then they are pointed away from us and are less powerful and occur in less dense environments those associated with Gamma Ray Bursts. 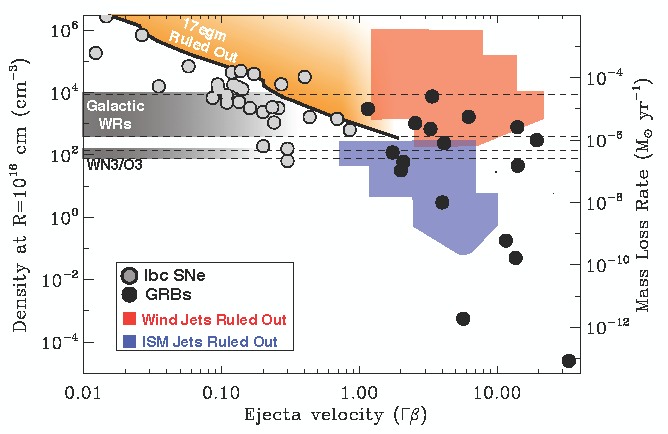 The next step in this research is to get observations of SLSNe years after the explosion to conclusively detect or rule out jets.